CREATIVITY: Judges look at the amount of detail in the actual shot entered for each assignment, and the props (objects, etc.) & background used to “show-off” your model. It is good to be as cohesive as you can with the overall idea/theme you choose you do for your shots. (Make sure you pics are easy for the judges to understand your creative vision for the shot). You are allowed to submit short descriptions, explanations, and/or intros to each shot you submit to help us to understand what you were aiming to achieve in your picture. POSE/STYLE: You will always want to be sure your model’s look/style is different from the previous round or application shot; the attire of your model scores in the Pose & Styling category. Also please be sure that the actual pose ties in with the assignment’s requirements or the overall theme/idea/creative vision you are aiming for in your pics. It is not required to use pose player…some shots can achieve the necessary pose in-game with creativity. We do not deduct points if pose player is not used. You are scored according to how well the pose ties into your shot. QUALITY: The aim for quality is magazine quality. Judges look at the amount of cleanness/clarity (are shots fuzzy/blurred in areas), focus, lighting, and the amount of detail of the actual model that is showcased in your pics. Please remember that we do not deduct points for shots which are purposely blurred; however, it is best to explain this briefly with your entries to insure points are not deducted unnecessarily. We felt lots of love from everyone's Valentine greeting cards, you all did a fabulous job! Thank you everyone for participating in this cycle of SMC, each and every round was always very close with scores. Everyone did fantastically! Well, the judging starts now...lets see the results. *Round 4 has Amy, Jen and Mamaj judging. *Winner's Wrath will not apply to the Final Round. NOTE: Be sure to scroll down to get your placement siggys everyone! You are all 3 classified as "Finalists" for R4 and the siggys represent your placement for this round. The Overall Pole Winner is revealed below. Congratulations to you all!!! Comments: I just love the soft color choices you used throughout this pic, it is very serene. I really like the three-tone coloring in your “Happy Valentines” text, and the font used is very attractive. I just love Stevie’s dreamy eyes and her soft makeup, it compliments the setting perfectly. The roses in her hair and hearts in the bkgd definitely add the Valentine vibe to the pic. *There is only one thing I think would improve the pic, and that is: to have used flowers rather than the feathers. I do think the feathers are beautiful and they look very nice in the pic, I just think they don’t compliment the overall theme in your pic of the hearts and roses. If the feathers were roses instead, I think it would fit a bit better with the rest of the pic. I do like that the feathers appear to compliment her outfit, it’s just with the hearts, roses, and feathers it is just a tiny bit overwhelming. But only a little, because this is one amazing pic nonetheless. Beautiful work! I have enjoyed looking at your very stylish and awesome pics throughout the entire competition. Thank you so much for sharing your creativity! Comments: This shot is beautiful, Tonya. Aspen looks feminine, soft and romantic. Love, love, love the background, so subtle yet stunning. The roses are delightful the way they go right down the plait. The only thing I would do would be to take just one row of roses off the hair so we could see more of your hair, otherwise this is perfect. Just a tip, run around your eyes and lips with a sharpening small brush. I do this before I put in any submission to the eyes, lips and any jewellery and it does make them pop even more, but your quality everywhere else is excellent! Comment: I love the soft colors, the band of roses around Stevie's head and cascading down her braid. I think a more seductive pose would of suited this card a little more (Stevie winking or blowing a kiss) as I get a romantic sense looking at this. The diamond and petals I felt were a bit to smudged and blurred. Nicely done! Happy Valentine's Day! 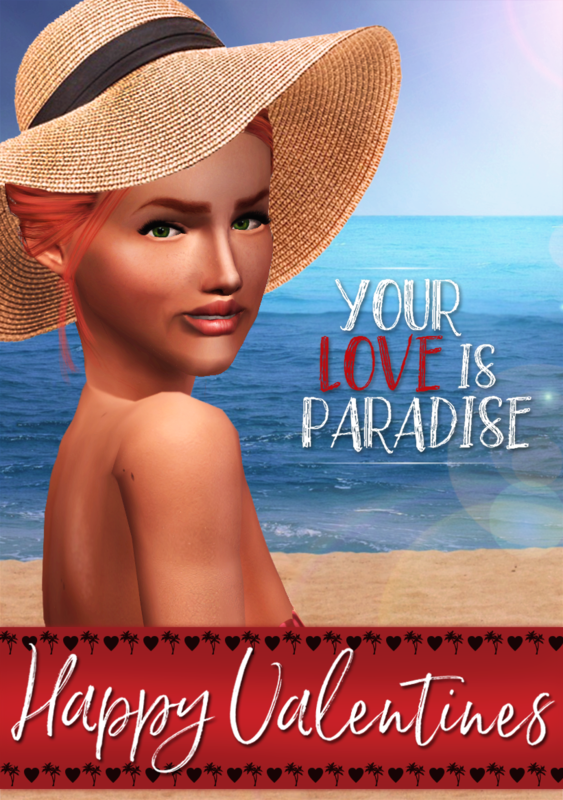 Comments: I really love your idea for this Valentine card, and I think the paradise theme was a brilliant choice…especially with winter going on where I’m at right now. Lol -I’d be extremely happy to get a tropical themed card during the cold month (where I live) of February. I think the lighting is excellent and you’ve matched the sun and solar glares perfectly. India’s sun kissed look and soft makeup really fits in with the beach theme, and the hat and hanging hair compliment India’s overall look beautifully. Very nice touches! The pose really sets off the whole look of the setting. There isn’t anything I would change or that I think would improve this pic. Beautiful work! I think you have done wonderfully throughout the entire competition, and I’ve really enjoyed seeing all your piccies! Thank you so much for sharing your creativity! Comments: This shot looks like an ad for a romantic getaway to a paradise. Beautiful model and the background adds a feel of romance to the whole shot. India’s tanned appearance looks like she belongs on the beach. Where her shoulder meets her back I often find using a small blending brush on a low opacity in that joining area softens the joint and helps make it look even more realistic. Try it, I find it works effectively. Comment: I love the whole tropical feel shown here, but I just felt that there is something missing. The pose I think could of been either India winking or blowing a kiss. Overall very nice and it does have the Valentine's feel. Happy Valentine's Day! Comments: This is one stunning Valentine’s Day card. I love the deeper, darker color palette used throughout the pic. The heart earrings and pose is very adorable, and I also like the hearts in the bkgd. Niska’s white hair stands out beautifully against the bkgd, and of course you gotta love the matching red lipstick and nail polish! All very nice touches indeed! *There are only 2 things for me that I feel would make the pic perfect: to add the “S” to Valentine, and if the “LOVE” at the bottom of the card wasn’t covered over - so that the “L” could be easily identifiable (it kinda looks like an “I”). Other than that this is perfect to me, and I think you’ve done a fantastic job throughout the entire competition. I’ve really enjoyed looking at your amazing piccies. Great work! Thank you so much for sharing your creativity! Comments: Niska looks so gorgeous! Love the bold reds and pinks in the background against her blond, silky hair. Really makes Niska “pop”. Well worth magazine quality and the 3D effect with the writing in the foreground and her in the background along with the thick border makes it look like a page out of a magazine already and gives it substance. The quality is great, just watch which skins you use as some can give the impression that the ladies have an “after 5 shadow”. You can easily lighten it with the dodge tool on a low opacity and this helps lighten that jaw and chin-line a bit more. This has to be my favourite for this particular round. Comments: I get a very Valentine's feel just looking at this card. I love the red rhinestone accents on Niska's dress and her earrings and the diamonds on the greeting. The pose I felt was very nice and showed that this is a valentine's card. For editing, I felt that the word "Love" was covered up a bit too much making it difficult to see the "L" and "E". Overall nicely done! Happy Valentine's Day!